Approx. 350 million years old. These fossils are found in the Atlas Mountains of Morocco. 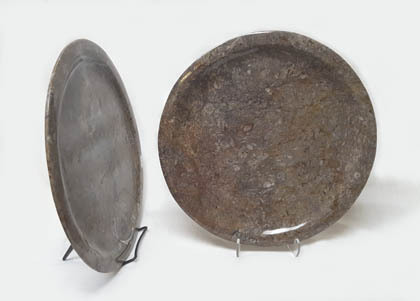 Plates have multiple fossils and are available in 3 price/size ranges. OFP/S - $14.00: approx. 5" x 7"
OFP/M - $20.00: approx. 7" x 9"
OFP/L - $25.00: approx. 8" x 11"
These display perfectly with a DSE6 or DSE7.5 stand. Orthoceras are a squid-like Marine Cephalopod that are approx. 350 million years old. These fossils are found in the Atlas Mountains of Morocco. All fossils come with an information card for each fossil. 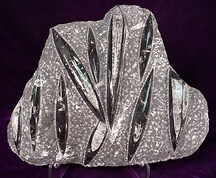 Single Orthoceras Fossils start at approximately 4" at $4.00 up to approximately 8" at $6.00. Orthoceras are a squid-like Marine Cephalopod approx. 350 million years old. These fossils were found in the Atlas Mountains of Morocco and have the fossils polished to show the detail of these lovely specimens. These plates are truly one of a kind display pieces! OFS/75: ($75.00) approximately 12" x 20"
OFS/100: ($100.00) approximately 18" x 24"
OFS/125: ($125.00) approximately 25" to 32"
Our DSE15 acrylic stand is a perfect fit for these breath-taking fossil plates. Orthoceras are a squid-like Marine Cephalopod that are about 350 million years old. These fossils are found in the Atlas Mountains of Morocco. All fossils come with an information card for each fossil. Our Small Orthoceras Fossils are approx. 2" - 2.5" long and polished on the top to showcase the intricate patterns of the fossil. NEW!!! For a short period of time we also have Extra Small Orthoceras fossils! They are approx. 1.5" - 1.75" long and are sold in packs of 10 for $7.50! Price is $4.00 each, Sold in package of 6 each. Orthoceras are a squid-like Marine Cephalopod, approx. 350 million years old. These fossils are found in the Atlas Mountains of Morocco. All fossils come with an information card for each fossil. 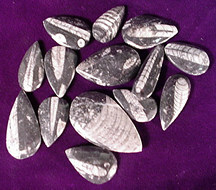 Medium Orthoceras are approx. 3" to 5" long. These Orthoceras specimens are captured in a stand up matrix, and are approximately 350 million years old. OFS/13 measures 4.5" to 6.5" tall and 2.5" to 3.5" wide. OFS/24 measures from approx. 9" to 12" tall and 2.5" to 4" wide. 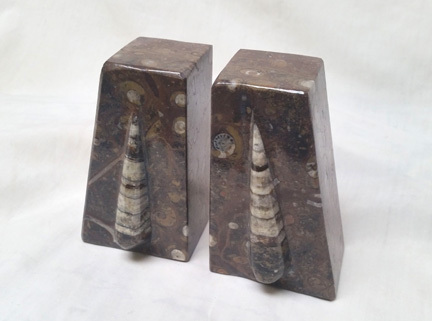 These Orthoceras specimens are captured in a stand up matrix and are approximately 350 million years old. This product is available in 2 sizes. The polished mineral matrix may be either brown or black (requests for specific colors will not be honored). 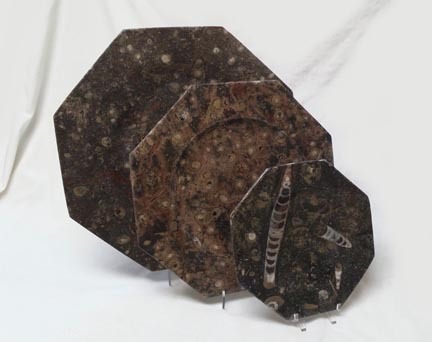 The small is $13.00 and approximately 1" - 2"W and 6" - 8"H. The large is $16.00 and approximately 2" - 3"W and 8" - 10"H.
These Octagonal Fossil Dinner Plates are sure to be a conversation starter! They are available in 3 sizes. Small (8") for $15.00, medium (12") for $30.00, and Large (14") for $40.00. 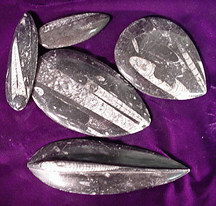 These attractive plates are sculpted from Orthoceras and Ammonite fossils in matrix that have been polished smooth. Very limited supply, so order while they last!!! These Orthoceras specimens are captured in a stand up, fully polished matrix, and are approximately 350 million years old. They are approximately 4" wide and stand approximately 16" in height. Orthoceras are a squid-like Marine Cephalopod that are approx. 350 million years old. These fossils are found in the Atlas Mountains of Morocco. 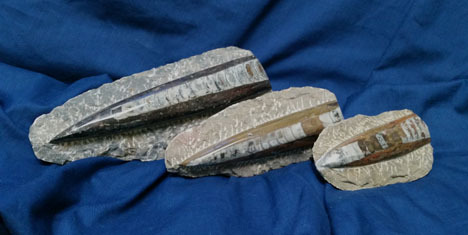 These single Orthoceras Fossils are brown in color, are polished in a rough matrix, and are approximately 4" - 10" in length. 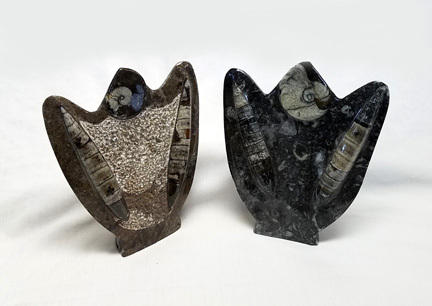 These unique Ammonite and Orthoceras Sculptures have polished edges. Some have rough centers while others are fully polished. 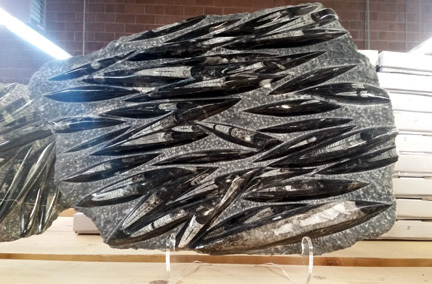 Each piece is a UNIQUE work of art and will make a great centerpiece or accent for any display. These pieces are approximately 6" x 7" but do vary some in size and shape.